If you ask almost any dentist about the best way to replace missing teeth, they’re likely to start talking about all of the benefits of dental implants. Thanks to advances in placement and restoration techniques, this remarkable treatment is available to more people than ever. If you would like to investigate dental implants for yourself, your restorative dentist in Newington would be happy to sit down with you and discuss whether this life-changing procedure is right for you. You undergo any necessary preliminary work. Some patients need a bone graft, gum disease treatment, or extractions before they can receive implants. During the implant placement procedure, an experienced dentist will insert small titanium cylinders into your jawbone at strategic locations. As you heal from the placement surgery over the next few months, your body forms a bond with the implants. This natural process, known as osteointegration, provides the strongest base possible for your new teeth. Your dentist designs and places restorations (crowns, a bridge, or dentures) on top of the implants. Comprehensive tooth replacement. 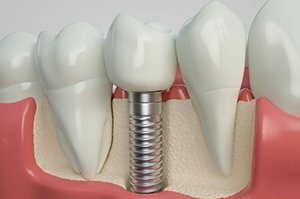 Implants replace both the roots and crowns of missing teeth. This can make them very sturdy and enable them to prevent the bone deterioration in the jaw that occurs after tooth loss. Long-lasting. With proper care, implants may last a lifetime. Other tooth replacement options may last for just 5 – 15 years. High success rate. 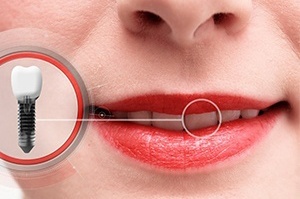 Over 95 percent of dental implant cases are successful! The restorations that go on top of implants are made of high-quality materials, such as porcelain and acrylic. They closely resemble the look of natural teeth. Natural function. Eating, speaking, and oral hygiene are usually easy with dental implants. Benefits to remaining natural teeth. Implants can prevent your natural teeth from drifting out of place, thus helping you to maintain a strong, well-aligned bite. 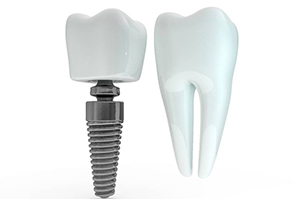 Dental implants are a versatile tooth replacement option. They’re able to replace one tooth, a few teeth, or an entire arch of teeth. If you are missing just one tooth, your dentist will likely recommend that you get a single dental implant. A custom crown will go on top of the implant to complete your smile. If you are missing a few teeth in a row, an implant-supported bridge might be right for you. This type of restoration is supported by an implant on each end, each of which has a crown on top. An artificial tooth or two is suspended between the crowns. For individuals who have suffered extensive tooth loss, an implant-supported denture could be the ideal solution. These prostheses are supported by just a few implants inserted at strategic locations throughout the mouth. Implant dentures are generally more secure and comfortable than their traditional counterparts. The best way to find out if you are a candidate for this procedure is to schedule a consultation with your dentist, who will perform a thorough examination of your mouth. Non-smokers who are are free of gum disease and who have adequate bone density and bone height in their jaw tend to be an ideal fit for the implant procedure. However, even if you smoke or have other issues that make your case a bit on the complex side, you may still be able to enjoy all of the benefits that dental implants have to offer. There are a number of factors that contribute to the overall cost of dental implants in Newington. The placement surgery, the abutments (which attach the implants to the restorations), and the restorations each come with their own price. It’s worth checking with your dental and medical insurance to find out if they’re willing to cover a portion of the cost of any aspect of your implant procedure. Dental implants may seem expensive, but they are a worthwhile investment! Their longevity, beauty, and strength make them the ideal tooth replacement option for many individuals who are hoping to regain their lost smile.